Decide on the tone. How serious or lighthearted do you want the eulogy to be? A good eulogy need not be uniformly somber, just appropriate. Some eulogy-writers take a serious approach, others are bold enough to add humor. Used cautiously, humor can help convey the personality of the deceased and illustrate some of his or her endearing qualities. The tone can also be partially determined by the way the deceased passed away. If you’re giving a eulogy about a teenager who met an untimely death, then your tone would be more serious than it would if you were giving a eulogy about a grandparent who happily lived to see his ninetieth birthday. Consider the audience. 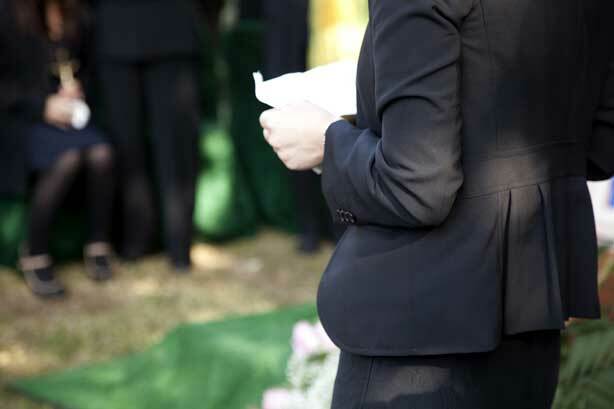 Write the eulogy with the deceased’s family and loved ones in mind. Dwell on the positive, but be honest. If the person was difficult or inordinately negative, avoid talking about that or allude to it gently, as in “He had his demons, which were a constant battle.” Make sure you don’t say anything that would offend, shock, or confuse the audience. For example, don’t make any jokes or comments about the deceased that would be a mystery to the majority of the crowd. Briefly introduce yourself. Even if most people in the audience know you, just state your name and give a few words that describe your relationship to the deceased. If it’s a really small crowd, you can start with, “For anybody who doesn’t know me…” or something that shows that while most people do know you, it’s still important to introduce yourself. If you’re related to the deceased, describe how; if not, say a few words about how and when you met. State the basic information about the deceased. Though your eulogy doesn’t have to read like an obituary or give all of the basic information about the life of the deceased, you should touch on a few key points, such as what his family life was like, what his career achievements were, and what hobbies and interests mattered the most to him. You can find a way of mentioning this information while praising or remembering the deceased. Write down the names of the family members especially closed to the deceased. You may forget their names on the big day because you’re overwhelmed by sadness, so it’s advisable to have them on hand. Make sure you say something specific about the family life of the deceased — this would be very important to his family. Use specific examples to describe the deceased. Avoid reciting a list of qualities that the person possesses. Instead, mention a quality and then illustrate it with a story. It is the stories that bring the person–and that quality–to life. Talk to as many people as you can to get their impressions, memories, and thoughts about the deceased, and then write down as many memories of your own as you can. Look for a common theme that unites your ideas, and try to illustrate this theme through specific examples. If the deceased is remembered for being kind, talk about the time he helped a homeless man get back on his feet. If the deceased is known for being a prankster, mention his famous April Fool’s prank. Pretend that a stranger is listening to your eulogy. Would he get a good sense of the person you’re describing without ever meeting him just from your words? Get feedback. Once you’ve written the eulogy and feel fairly confident in what you’ve written, have some close friends or family members who know the deceased well read it to make sure that it’s not only accurate, but that it does well with capturing the essence of the deceased. They’ll also be able to see if you’ve said anything inappropriate, forgotten something important, or wrote anything that was confusing or difficult to understand.